VEA General Assembly Daily Reports: Circular Firing Squad Enables Voucher Bill to Pass? 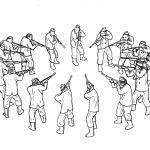 Circular Firing Squad Enables Voucher Bill to Pass? The passage of this bill will dry up donations to public school foundations. Those who contribute to the private school voucher entities will receive a 65% state tax credit plus the federal deduction for a charitable donation. Those who contribute to public school foundations will receive only the charitable deduction. Corporations who want to do something for schools will have a much greater incentive to send their money to private schools. State policy now will encourage parents making up to $69,000 a year to abandon our public schools. I’m not sure we could have stopped this bill from passing, but the truth of the matter is that the education lobbyists on both sides of the issue could have worked this bill a lot harder had we not been fighting each other over the VSBA/VASS bill, HB 576, which deprives Virginia’s teachers of what little rights they do have under Virginia law. I can’t help but wonder, would things would have been different if we had all been fighting together to protect public education rather than forming a circular firing squad? I can’t help but feel that we are heading for a decline in the quality of public education in Virginia.